we are finally able to enjoy the fruits of our labor and lounge around the booth carefree! but only cause we are wearing heels. we still haven’t found time for manicures. we have to do that tomorrow! geez! if you’re in town, please come by! goofy good fun! oh it’s midnight and i’m officially going pumpkin. i don’t know if i’ll be back tomorrow cause i heard it’s a silent blogging day in a moment of silence for japan. ok darlings, thank you again for my boost, i needed that! tomorrow i’ll get out of the booth and cover some of the show to share with you. tonight, bonne nuit! March 18, 2011. 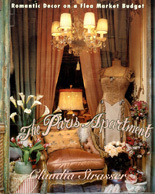 Architectural Digest Show, postaday2011. Can’t wait to see some updates from the show. Your booth looks beautiful! March 18, 2011 at 4:41 am. Permalink. That wallpaper is gorgeous with all your things! March 18, 2011 at 4:42 am. Permalink. March 18, 2011 at 4:59 am. Permalink. March 18, 2011 at 5:45 am. Permalink. March 18, 2011 at 6:16 am. Permalink. March 18, 2011 at 6:23 am. Permalink. Everything looks fabulous. I love that wall paper too. March 18, 2011 at 6:34 am. Permalink. March 18, 2011 at 8:22 am. Permalink. March 18, 2011 at 8:37 am. Permalink. March 18, 2011 at 9:54 am. Permalink. March 18, 2011 at 11:09 am. Permalink. March 18, 2011 at 12:10 pm. Permalink. Looks beautiful! Can’t wait to see it tomorrow. The girlies are getting dressed up to match your booth! March 18, 2011 at 12:53 pm. Permalink. All the hard work was definitely worth it, the booth is gorgeous and so are you ladies! I love the doors, they are the finishing touch, and the mirror is to die for. Good luck to you and I hope you have a fabulous weekend. March 18, 2011 at 1:10 pm. Permalink. Lounge around–right, now you’ll market your business, which is the entire point. I have a tremeau like your’s no fooling. I bought it from an antique/designer who was on the cover of Architertural Digest in the 1990’s. It had no mirror, I put a mirror in it and the guy who did the work wanted to lay it on my frontroom rug and drop the mirror into it–I had a fit. It was ugly but I got it done right. I love that thing, it’s hung with airplane wire. It’s got the big Louis XV cartouche on top and it sticks out considerably from the frame. I cleaned the cigarette smoke stains off of the pinkish paint with clarified water, small amt. of ivory soap on q-tips (just east of damp) and it took weeks but it was worth it. 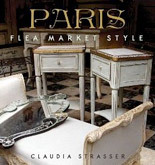 Love french, can’t get enough of it but living in Placerville, CA-not much french up here. You’ll do great at the show! March 18, 2011 at 2:23 pm. Permalink. 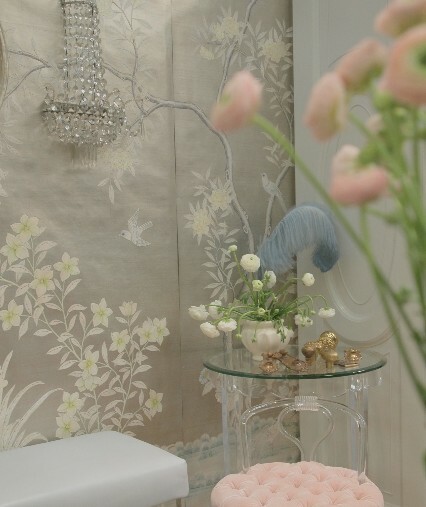 Ladies, we absolutely loved your booth over here at Robin Baron Design. 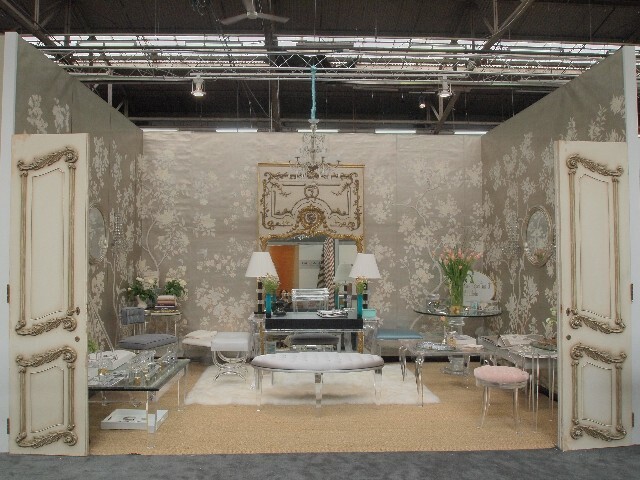 When we got back to the office after the AD show and were rehashing our favorites, one of my designers Caitlin was going on about the lovely lucite pieces, the Gracie wallpaper, the Plaza hardware, etc. Best of luck for the rest of the show! Go get those manicures! March 18, 2011 at 2:35 pm. Permalink. Claudia, your booth looks absolutely glorious! Love the palette. I wish I could be in NYC and go there. By the way I always come around your blog to have a break from my day and and get inspiration! March 18, 2011 at 3:20 pm. Permalink. Claudia, It was so nice to meet you Thurs @AD show. Seeing the photos of the booth before and witnessing the after ~ c’est magnifique! March 18, 2011 at 3:46 pm. Permalink. THE BOOTH LOOKS PERFECTO!!! THE DOORS ARE SO RIGHT..
March 18, 2011 at 4:06 pm. Permalink. Looks amazing !! Would stop by if I was in the area. Have fun. March 18, 2011 at 4:42 pm. Permalink. I love all the photo’s. Your are an amazing designer, this is truly gorgeous as no words have been invented yet to tell you how amazing this is!! March 18, 2011 at 5:29 pm. Permalink. March 18, 2011 at 6:47 pm. Permalink. Hello. Oh my how lovely the booth is!! I just want to come and sit and never leave its so beautiful!!! 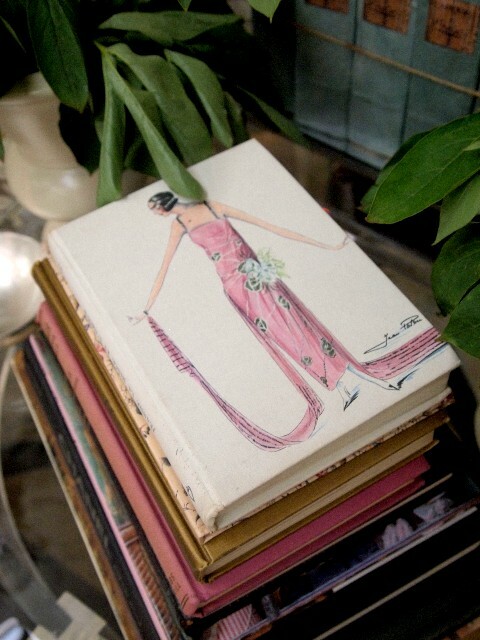 What is the book with the lady form the 20’s on it?? And is all the furniture for sale?? Thanks for the lovely inspiration. March 18, 2011 at 9:09 pm. Permalink. March 18, 2011 at 9:53 pm. Permalink. Oh my word. How fabulous are you? March 19, 2011 at 5:07 am. Permalink. So happy for you. I know there will be lots of projects coming your way after this. Everything looks amazing. March 19, 2011 at 10:34 am. Permalink. hi guys! i can’t thank you enough for your sweet compliments! the show has one day left and i have had no energy to even open my computer lid. i can’t wait to come visit when this winds up. see you soon! March 20, 2011 at 12:47 pm. Permalink. March 20, 2011 at 8:03 pm. Permalink. Wish I could have been there, Claudia! You look marvelous and I love your friend/colleague’s outfit! Very stylish. March 21, 2011 at 3:38 pm. Permalink. I don’t believe I have a complimentary word that hasn’t been used already! So…….DITTO to every descriptive word used by your captivated and infatuated followers in stating the obvious! March 22, 2011 at 7:21 pm. Permalink. This is a great inspiration for my Creekwood North! thanks for the inpiration. March 24, 2011 at 8:44 am. Permalink. I also want to FEATURE YOU at some point… I see you are very bizee now… but hopefully soon!!! March 24, 2011 at 3:44 pm. Permalink. March 24, 2011 at 10:48 pm. Permalink. March 26, 2011 at 7:40 pm. Permalink. 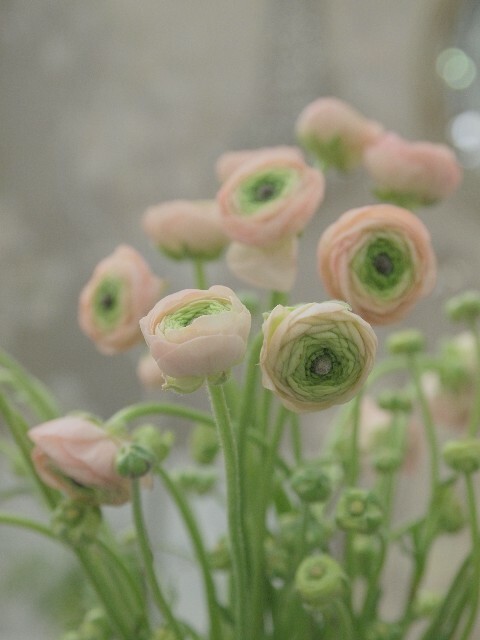 Your incredibly gorgeous photo of the pale pink and green ranunculus is making me go nuts looking for the variety. Do you know the name, please? March 23, 2012 at 7:26 pm. Permalink. November 25, 2016 at 6:15 pm. Permalink.